Eleven people are now known to have died in a train crash in south-east Australia, which left as many as 50 people wounded, some seriously. Police said several people were still unaccounted for as rescuers searched the wreckage near the farming town of Kerang in central Victoria state. 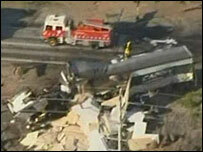 The passenger train was travelling to Melbourne city when it collided with a lorry at a level crossing. Police said it was not yet clear what had caused the crash. The most seriously injured - including a young child - were being airlifted to hospitals in Melbourne 281km (175 miles) away. The train was 40 minutes into its journey from Swan Hill, north of Kerang town, to Melbourne when the collision happened at a level crossing at 1340 (0340GMT). The impact of the crash was so severe that some carriages were flipped onto their sides, the BBC's Phil Mercer in Sydney says. One passenger who had been sitting in first class described the panic on board. "All we could hear was people screaming and crying and moaning - it was just awful, devastating," Sue Fyffe told Sky News television. "There was just glass, and elderly ladies sitting there, I helped some of the elderly who had lots of cuts, some of them had broken bones." Ms Fyffe said the truck hit the carriage behind hers. "The truck just didn't stop, he tried. I don't know whether he didn't see the train until the last minute, but he tried to divert and hit the carriage behind me and we just felt it," she said. "It just felt as if the whole train was going to derail. The carriage behind mine is just half gone; there's a big gaping hole in the carriage behind." At least 12 people were reported to be in a serious condition after the accident. Six ambulance teams as well as two helicopters and two aircraft were immediately sent to the crash scene 10km (six miles) north of Kerang. Local officials said the level crossing had flashing lights but no safety barriers. The transport minister, Lynne Kosky, was due to make a statement later.